Thank You Maestro Amaradeva for the Immortal Music and Songs and The Joy You Brought to our Hearts! Rising beyond political or other differences, Sri Lanka yesterday bade farewell to Pandit W.D. Amaradeva, whom the equally famous cinema legend, Dr. Lester James Peris described as a man whose magic voice was the greatest musical instrument we have ever produced. The magic of his voice, the exquisite permutations and combinations of notes that comprise his melodic creations, the pristine perfection of his pitch and his impeccable phrasing added up to make him the greatest of Sri Lanka’s vocal artistes, said the founder of Sri Lanka’s modern cinema. Pandit Amaradeva passed away around 11 am yesterday at the Sri Jayewardenapura Hospital in the historic city of Kotte after he suffered a heart attack around 6.30 am. Though he will not be present among us physically, Sri Lanka will always be alive with the sound of his music and the songs he has sung for the next thousand years. He will fill our hearts with the songs of his music and our hearts will long to hear every song that he sang. We will go to Pandit Amaradeva when our hearts are lonely, knowing that we will hear what we heard before. Our hearts will be blessed with the sound of his music or songs and we will sing once more, as in the words of an immortal song. Pandit Amaradeva in heart and mind was closely linked to our culture and civilization, our nature and our character. For instance we believe he would have listened to the ocean that surrounded our country, he would have heard the echoes of a million sea shells forever in motion, and moving to a rhythmic, unwritten music that is played eternally. Philosopher and medical specialist, Professor Carlo Fonseka, a close friend and admirer of Dr. Amaradeva, wrote recently that in the Kingdom of Sinhala Music and Song, Pandit Amaradeva was the anointed sovereign. “It is true to say that the more we know him the more we love him; but the more we know of him, the less there is that is both original and significant we have to say about him. So all one can do now is to ask rhetorically: “When comes such another?” and answer: “Never,” says Prof. Carlo Fonseka. According to Prof. Carlo, there cannot be any doubt about Pandit Amaradeva’s role in uniting the nation to which he and we belong by the magic of his music. 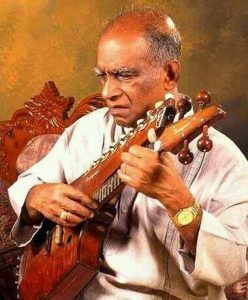 The melody he created for Dalton Alwis’s lyrics, “Sasara Wasana Thuru” and the exquisite style with which he performed it vocally made Dr. Amaradeva the noblest promoter of patriotism in our nation. For these and other songs Sri Lanka today says thank you Dr. Amaradeva for all your songs that we will be singing for ages or generations to come and for the joy they will be bringing. Once again thank you for the music and the songs, thank you for giving it to us. « Lanka’s Legendary Music Maestro W.D.Amaradeva Passes Away at Age of 88 Due to a Heart Attack.